The Pro Football Hall of Fame Spotlight Game for week 4 features the Tennessee Titans and the Baltimore Ravens. 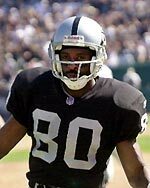 Jerry Rice caught 5 passes for 91 yards and scored two touchdowns in the Raiders' convincing 38-14 win over the Seattle Seahawks in Oakland on Sunday. Rice has ranked as the NFL's all-time leading receiver since the final week of the 1995 season. His career totals now add up to 1,295 receptions for 19,432 yards, and an incredible 178 touchdown catches. Quarterback Kurt Warner of the St. Louis Rams earned Miller Lite Player of the Week honors for his role in the Rams 42-10 win over the Miami Dolphins on Sunday. Warner completed 24 of 31 passes for 328 yards and threw four touchdowns. The Rams improved their record to 3-0 with the win and currently lead the NFC West.